Best Tuner for 6.0 Powerstroke Reviews: Top 4 in April 2019! 2019’s List of Top-Rated Tuner for 6.0L Powerstroke! Hi all, this is Ken, your online auto-mechanic, and this time I have been asked to provide a guide for the best tuner for 6.0 Powerstroke engines from Ford. Now I expect that my readers already know that there is no real best programmer for 6.0 Powerstroke engines, there are competing brands that provide equal services, and the bottom line is personal preference. Some tuners will give more on the read and erase while others will give more flexibility in programming using preset tunes. However, the bottom line will always be; you pay for what you get, and the more you pay with tuners will provide you with more power and flexibility. Essentially, there are three layers to these devices, the basic layer for beginners, and quick tunes, the intermediate devices that provide versatile readings and settings, and the top layer which are professional devices. This guide will concentrate on the intermediate layer that provides great versatility with good value for money. I have selected the top four devices, any one of these should provide sufficient calibration and optimization for your Ford 6.0l or 6.2L Powerstroke engine. 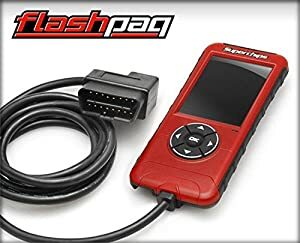 The Superchips Flashpaq for Ford (PN 1845) is a small device; it’s the basic, intermediate package that provides ample versatility for a fast and as you drive to record and review action. This device will work with a lot of Ford engines, including the 6.0L Powerstroke, but will also cover 3.5L Ecoboost, 5.0L Coyote, and 6.7L Power Stroke motors. It comes with a 2-year powertrain warranty. The Flashpaq comes with a high-definition, 2.8″ color screen with a redesigned graphic interface that provides you with easy to read data. They have also increased the memory and added a faster processor for improved tuning and faster downloading for updates. This device comes with a USB connector for internet updates. The X4 Power Flash has so many pros it was hard to decide which ones to place in the intro. Essentially this is the super-intermediate tuner/programmer model for Ford 6.0L Powerstroke engines. This package comes with a set of preloaded proven Dyno tunes that makes immediate optimized tuning easy. It also allows you to create and save 20 personalized tunes. You can always quickly return the tunes to factory settings by pressing the “Return to Stock” feature and will save you a lot of hassle when having your engine checked by federal and state agencies. The screen is a classy full-color backlit LCD display panel and comes with a built-in WIFI connector, so you can link up to the internet for immediate updates as well as store your data on a cloud. This device will read and clear all DTC’s, and it monitors all your essential data as you drive. It will also increase your HP, torque, throttle response and fuel consumption efficiency. Axle Ratio: You can correct your vehicles speedometer and fuel consumption calculations when you re-align the axle ratio to the new gear ratios you set. CMCV Delete: This function lets you disable the Charge Motion Control Valve so that your check engine light will not turn on when you remove your CMCV plates. Disable DOD: This function toggles your Displacement on Demand function. Fan Control: This feature sets a lower starting on temperature for the fan. Global Spark: This feature will let you add or remove timing across the RPM ranges. Idle Adjust: This function will allow you to change the idle value, essentially you can optimize your voltage in idle, enabling you to use auxiliary electronics without depleting the battery. Intake Airbox: If you added an aftermarket air intake kit, this would disable the check engine light as well as tune the kit. Jake Brake: This adds the exhaust brake feature for lowering your brake temperature and improving your engine braking feature while towing heavier loads. Lock in 1-2-3: This function will lock the converter during 1st, 2nd and 3rd gears, essentially adding performance to your engine braking, improving fuel consumption efficiency and is great for increasing drag racing performance. Locked At CT: This function will lock the torque converter while you decelerate which is a smoother braking option to the Jake brake. You can use this feature with the Jake brake for a more robust engine braking option. 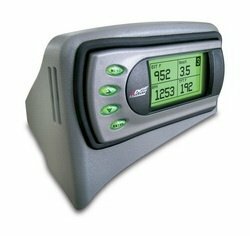 Mass Air Meter (MAF): You can calibrate to compensate for an aftermarket MAF. Multiple Displacement System (MDS): This will allow you to disable additional motorheads and give you a 4-cylinder option that is fuel saving for longer hauls. Rev Limiter: You can change the RPM rate before your engine’s computer comes into play. Essentially you reset the automatic limiter to protect your engine from overstating RPM’s. RPM Based Spark: This function will let you adjust the RPM range. Speed Limiter: This function will change the top speed your engine can reach before it sets in the automatic limiter. Super Charger Pulley: You can accommodate for different aftermarket supercharger pulley sizes. Throttle Body: You can adjust your system to accommodate for different aftermarket throttle body sizes. Tire Size: This will give your speedometer the correct ratios for determining your speed when you change your wheels and tires from stock. Torque Reduction: This feature allows you to reduce your torque during gear shifts. TPMS: You can toggle your tire pressure monitoring system. Traction Control: If you want to disable the vehicles traction button, you can do so with this function. Transmission Shift Firmness: This enables you to adjust automatic shift firmness. Transmission Shift Points: This allows you to change the RPM level between gear changes in an automatic transmission. The Evolution Programmer has a long history of being first, and it was the first programmer to monitor EGTs while the vehicle was being driven. With this extensive history of firsts, the Edge continues to provide leading technologies that read, adjust and clear data from your engine. On top of these functions, you also get to choose your power gains by levels, and there are 4 preset levels for you to choose from. These power gains were reached at 4,400ft above sea level, so expect changes at different land heights. Level 1 (Trans Only) This setting adds transmission line pressure to give firmer shifts. Summing up: This device comes with a special custom pod that will make your device look like it’s a stock item installed on your dash. 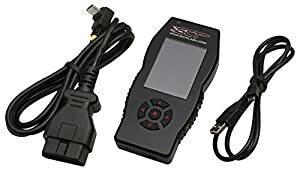 It is updateable via the internet connection, and it will give you a 0-60 with ¼ mile performance tests including reaction times and Christmas tree style lighting. 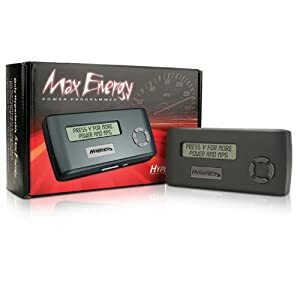 The Hypertech Max Energy Programmer 2004-14 Ford is one of the best there is on the market, and that’s why it is featured here. This small programmer is available for most gasoline, E-85, and diesel vehicles, and the provide a lot of versatility. This device will read and clear all DTC’s, it provides many calibration alternatives and comes with immediate improvement presets so that you can start off with a fast calibration, giving you time to program any personalized tunes. This device will provide optimum tuning for all 2013 F-150 3.7L/5.0L/6.2L, F-250/F-350 6.2L, and 2013 Mustang 3.7L. Fuel Injectors: You can adjust the parameters when you install different sized fuel injectors. There is more; you can quickly return to stock settings which is great in those pull over instances. It also provides some amazing preset tunes for all engine types. As you can see, there are some impressive devices out there at affordable prices. These are great little machines to have around, and if you are a professional driver, from ridesharing to haulage, these devices will optimize your overheads. They do reduce fuel consumption, give you the contacts metrics to save on car maintenance and will essentially make your work easier and less of a financial burden. Anyone of these devices will provide you with access to pre-set tunes that will optimize your engine’s performance. My suggestion is: if you are new to this scene, do not play around with personalizing your own tunes. Start off by understanding the pre-set ones; you can change them around a few times to see what happens. Once you understand how each tune function affects your vehicle, and you fully comprehend the incremental changes for every feature, then you can start to experiment. Just don’t blame the device if you blow up your engine. Final thought for the day: do not go out and buy the most expensive model, that’s stupid. Consider what make and model your vehicle is, and what you want to achieve, if you are a racer then you need to optimize for racing, and that of course then brings into consideration road surfaces. If you are a ridesharing driver or taxi (professional driver), then you need to calibrate for fuel economy and comfort performance. If you are a professional hauler, then you need to calculate for load weights and power shifting in up and down conditions. Finally, always consider braking as a serious function to focus on, optimized engine braking provides overall economy and safety.